Crustal plates cover the surface of the Earth. Large tectonic plates are named for the continents and oceans. Smaller plates are named for areas where they are located. For instance the Juan de Fuca Plate is located in the Pacific Northwest off the coasts of California, Oregon, Washington and British Columbia. Tectonic plates move around the Earth at different speeds. Scientists monitor plate speed movement using Global Positioning System (GPS) that uses space based satellites to track their movement. Plates that are separating form a divergent boundary. Plates slipping past each other horizontally form transform boundaries. Plates crashing into each other form collision boundaries. Collision boundaries are formed when an oceanic plate is forced beneath an ocean plate in subduction zones. When two continental plates meet they smash into each other creating great mountain chains like the Himalaya Mountains. The North American Plate, South American Plate, Eurasian Plate and the Pacific Plate are examples of large tectonic plates. 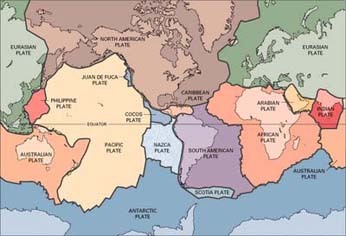 Smaller plates include the Juan de Fuca Plate and the Nazca Plate. There are frequent earthquakes along the borders of tectonic plates. Scientist use these earthquake patterns to determine the boundary between the plates. In the Pacific Northwest scientists sometimes refer to the Gorda Plate and Juan de Fuca Plate as two separate plates. Many geologists consider the two areas as a single plate and refer the entire area as the Juan de Fuca Plate. The Cascadia Subduction Zone located in this area is constantly being monitored. On January 26, 1700 a great tsunami occurred that devastated the area and sent waves across the Pacific Ocean that crashed into Japan. The area has a potential of a devastating 9.0+ subduction zone earthquake similar to the December 26, 2004 earthquake and tsunami in the Indian Ocean. Around the Pacific Ocean are a series of subduction zones at convergent boundaries like the Cascadia Subduction Zone. In these subduction zones oceanic crust is being recycled as it is forced beneath lighter continental plates or other oceanic plates. The Pacific Ocean is becoming smaller as the Atlantic Ocean increases in size. In the middle of the Atlantic Ocean is a divergent boundary that separates North and South American from Europe and Africa. Each year the continents move slowly further and further apart. Iceland sits atop the Mid-Atlantic Ridge. Each volcanic eruption increases the size of the island as lava flows upward from the mantle and erupts from one of the fissures on the island or a volcano.